LASH BOOST was launched using a definitive color palette, the blush color became the "brand color" for the product. We had previously commissioned fashion illustrator Miyuki Ohashi from Japan, to portray the Doctors in a series of short animations for the "what if" campaign. Her additions to LASH BOOST (along with Mineral Peptides, the Australia launch and more) fit right into place. 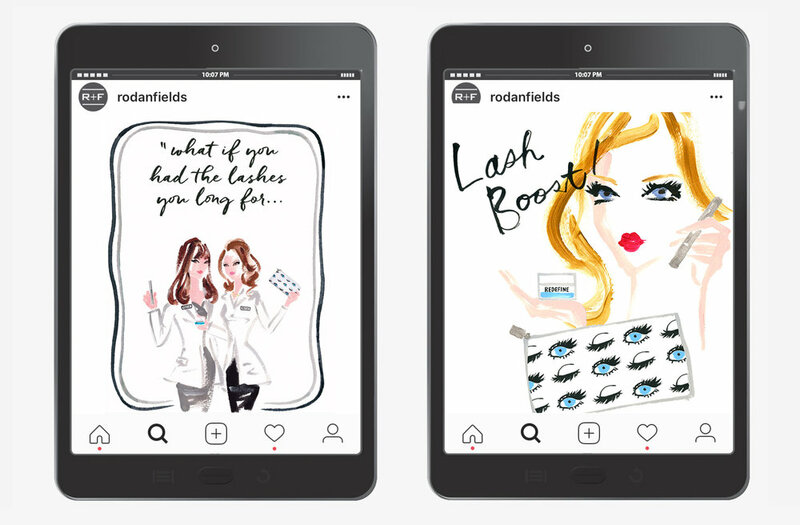 Her whimsical style and hand-lettering has become iconic to the R+F Brand- and in this case, key to the Lash Boost Launch. R+F SOCIAL MEDIA FOR "LASH BOOST"
SOCIAL MEDIA INSTAGRAM FEED FOR "LASH BOOST"